Looking for Fun Halloween Ideas? I’ve got you covered! As a kid, Halloween was my favorite holiday because I got to dress up and visit all the neighbors with my friends. Growing up with a serious sweet tooth, the candy was a major perk too. Once I had kids of my own, Halloween was even more fun. The only thing better than getting excited about costumes, candy, and decorations is watching your kids enjoy it all! As a result, I have a lot of fun thinking up ways to make Halloween extra enjoyable. 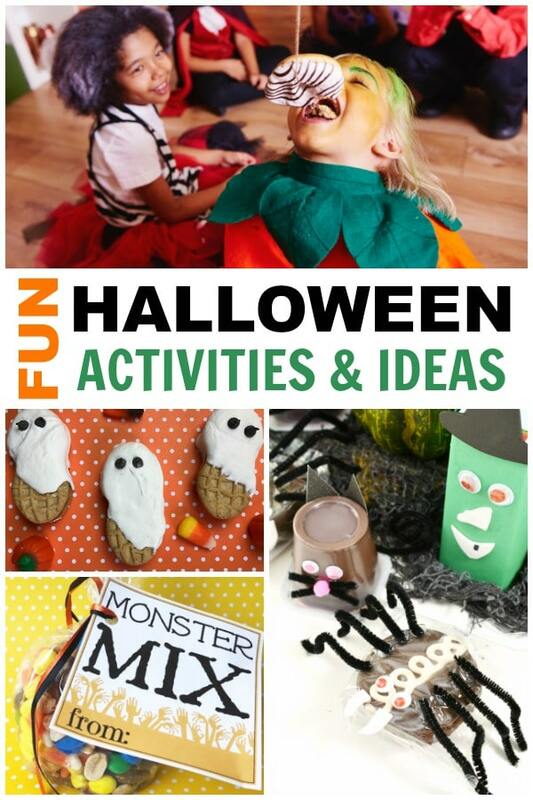 I hope you enjoy these fun Halloween ideas! I hope you find lots of inspiration below for a festive Halloween! Check out my tutorial that teaches you How to Make a Spider with a Donut. These Nutter Butter Ghosts are also really easy to make and just as cute! You can even stand the Nutter Butter Ghosts up in this Graveyard Cake. Here’s an entire collection of Halloween Party Recipes for your Halloween party. 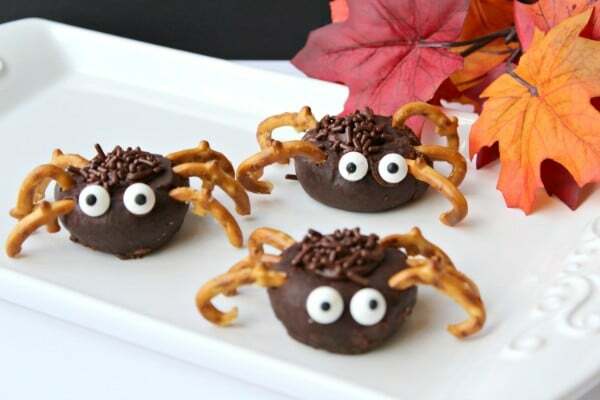 You don’t have to throw a party to have some Halloween fun with food. Try one of these Halloween Dinner Recipes. If you want to offer your kids some fun Halloween food that isn’t loaded with sugar, try some of these Healthy Halloween Treats instead. You can get a free cookbook with several of my Halloween party food recipes when you sign up for my newsletter. Surprise your child by sneaking this Juice Box Witch, Black Cat Pudding Cup or Cupcake Spider into his lunchbox. 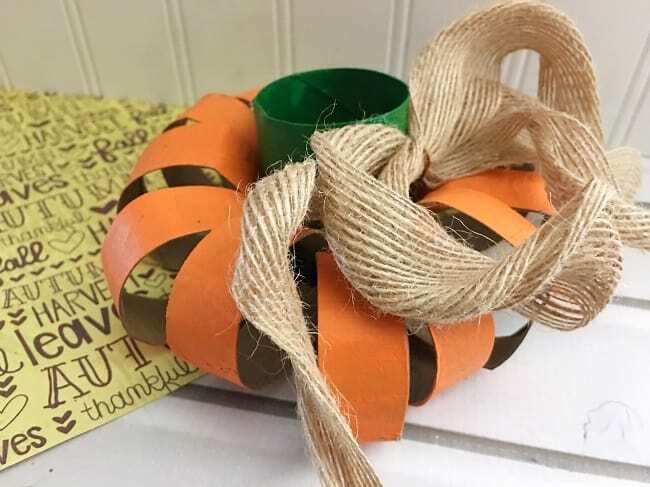 Upcycle your empty toilet paper rolls into this DIY Toilet Paper Roll Pumpkin. Save money with one of these Easy DIY Halloween Costumes. If you aren’t a fan of trick-or-treating, check out these trick-or-treat alternatives the whole family will enjoy. Planning a Halloween party? 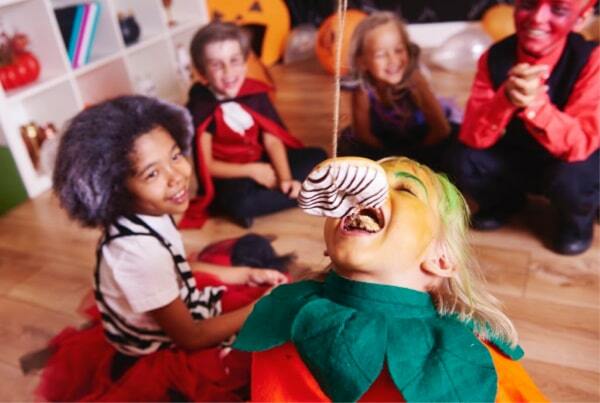 Check out all of these Fun Halloween Party Activities for Kids to keep your guests entertained. Have older kids? Share this list of Halloween Activities for Teens with them so they don’t have to miss any of the Halloween fun. Love scary movies? Here’s the Ultimate Horror Movie Calendar to Countdown to Halloween. And check out the Halloween Movies lists on Best Movies Right Now. You can find the best Halloween movies on your favorite streaming services (e.g. Netflix, Hulu) and by type (e.g. Movie Beasts, Kid-Friendly). Download these Free Printable Halloween Tags for Treat Bags that you can use as party favors or as fun snacks for your kids. 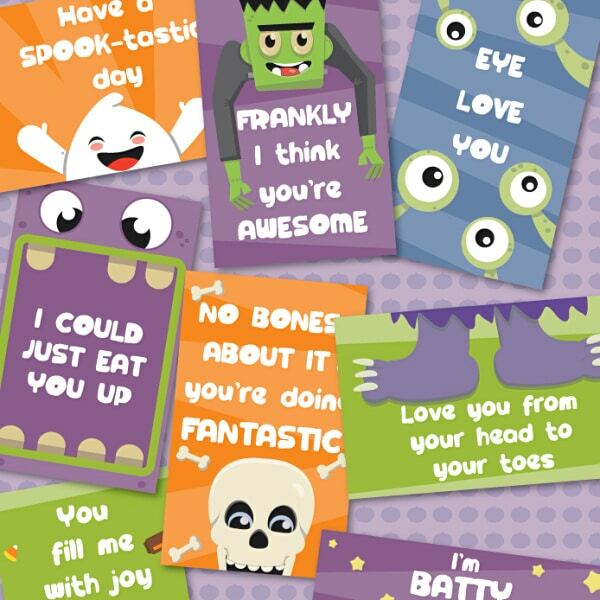 Sneak these Free Printable Halloween Lunchbox Notes into your kids’ lunches to surprise them with a mid-day reminder how much you care about them. Looking for a non-candy treat for your kids? Try these Printable Halloween Coupons for Kids. Don’t want to spend a lot of time or money on Halloween decorations? Try some of these Easy, Inexpensive DIY Halloween Decor Ideas. If you want to welcome, rather than frighten, trick-or-treaters, try one of these Non-Spooky Halloween Front Porch Ideas. Each of the articles listed above provides lists of any items or materials you might need to recreate them. If the ideas above have inspired your own ideas, you might be wanting to branch out and experiment. Halloween Hits – Songs you’ll recognize that are perfect for Halloween. Great for an adult Halloween party. Halloween Jams – Fun Halloween songs that are ideal for a Halloween party with kids. Halloween Music Collection – Eerie music that will set a spooky mood for a haunted house or an ominous way to greet trick-or-treaters. 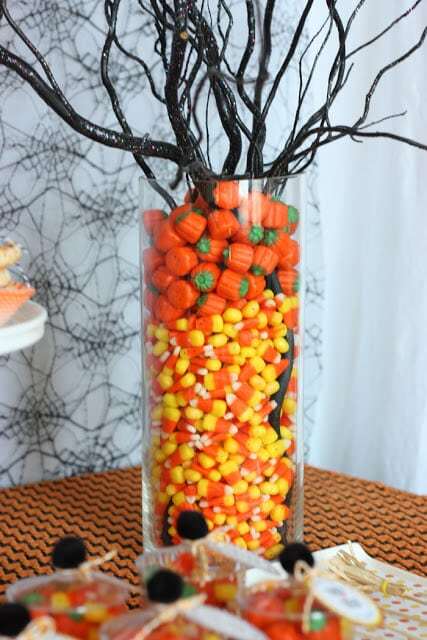 Even if you don’t like to eat it, Candy Corn and Mellowcreme Autumn Mix make great decorations. It’s easy to work them into a variety of Halloween ideas. Halloween Peeps are another great way to easily add Halloween fun to desserts and other Halloween projects. Because it’s so inexpensive, I use craft paper in different colors for a variety of projects. I also use pipe cleaners in many of my crafts. Don’t forget a low-temperature glue gun. I’m not a crafter and I use this all the time. Every year I pick up an assortment of mini Halloween buckets to use as candy dishes around the house or as treat holders we can surprise friends and neighbors with. Lighting is one of the easiest ways to create a Halloween ambiance. String up some orange or purple lights to add an eerie glow to your home. Then, set up some decorative spider webs to complete the effect. I hope you’ve found plenty of inspiration to have a fun and memorable Halloween! 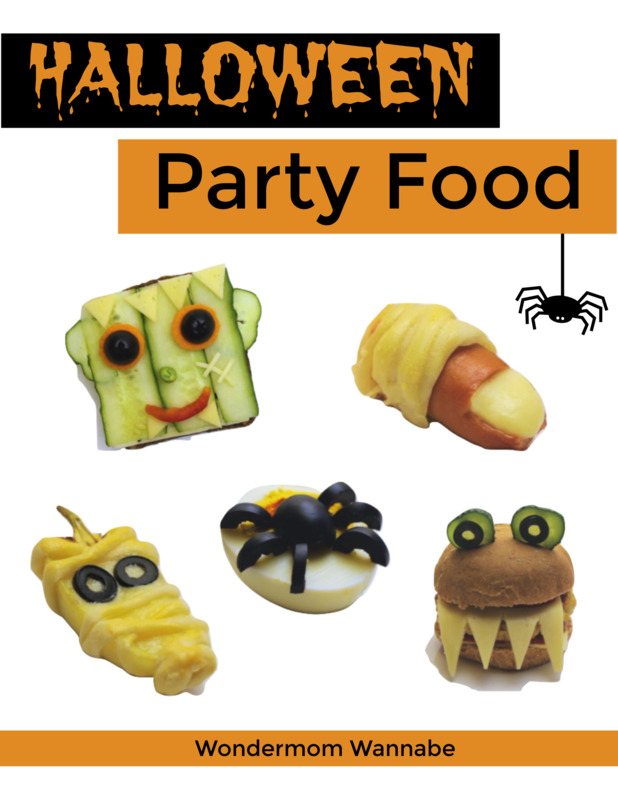 Don’t forget to grab your free copy of the Halloween Party Food cookbook when you sign up for my newsletter!